LaRosa from AsomBroso is like no other reposado, or tequila to date. To become LaRosa Reposado the 100% Agave silver is rested in relatively new French Oak casks that were previously used to make a vintage Bordeaux wine. Then something serendipitous happens: the basically colorless tequila takes on a reddish hue and the taste is transformed - it is still tequila, but a whole new style of tequila. Somewhat akin to comparing a basic bar scotch to a fine single malt scotch. 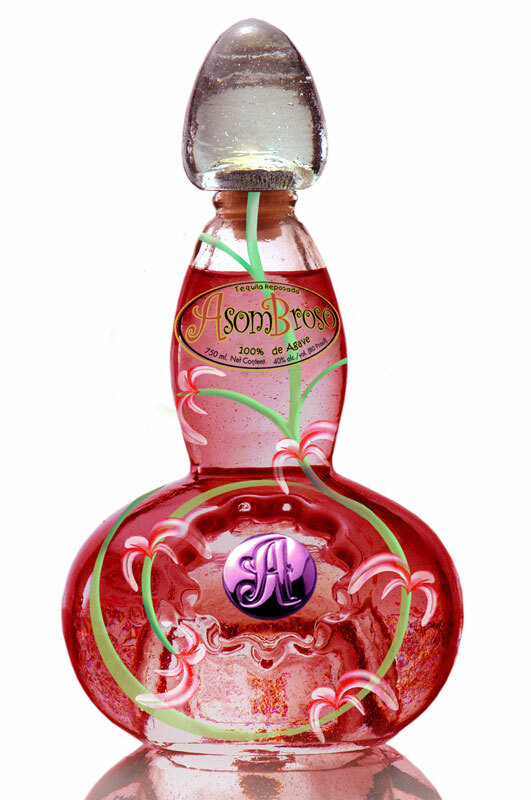 AsomBroso's LaRosa Reposado: AsomBroso's unique La Rosa Reposado is the World's FIRST tequila aged three months in French oak barrels once used for vintage Bordeaux wine. It has a pink hue color due to the influence of the barrels. La Rosa Reposada is best served neat and chilled in a snifter. The sweet floral scents bring out the characteristics of a vintage Bordeaux wine. The initial taste is spicy and peppery with a sweet and smooth vanilla finish. The La Rosa Reposado is packaged in distinctive hand-crafted and numbered bottles. Patterned after a decanter found in an 18th Century European castle, each AsomBroso˙ bottle is hand-blown and numbered, and the Anejo is also available in a cedar lined humidor box. Featured on the Today Show and awarded the prestigious ROBB Report Magazine's "The Best of the Best" tequila. AsomBroso represents the culmination of President/CEO Rick "Ricardo" Gamarra's personal quest, which began with a chance round of private-stock, "old style" tequila at a friend's home in Guadalajara, Mexico, which was the impetus for the launch of the AsomBroso line. Because of the stringent regulatory controls over the product, and the sophistication of its manufacturing process, it took Gamarra three years to bring the project to fruition. Wine Enthusiast gave AsomBroso Anejo a rating of 95, and Anthony Dias Blue of the Bon Appetit Tasting Panel awarded AsomBroso tequilas collectively, "the highest scores ever awarded in my tasting evaluations." Pretty amazing for a new kid in town, and fittingly, "amazing" is what AsomBroso translates to in English. AsomBroso Tequila Makes Impressive Showing at 2007 San Francisco World Spirits Competition: A relatively new producer of fine tequila made an impressive showing at the 2007 San Francisco World Spirits Competition. AsomBroso's Añejo "Extra Aged" Tequila and Silver Tequila were both awarded a Double Gold Medal. AsomBroso's unique Reposado Tequila was awarded a Gold Medal.